There is a wonderful sense of accomplishment in this “wow.” Although, once I began the course, I had no rational doubts that I would reach this moment, it is still a great moment of success. For years (and years – and even more years) I thought about enrolling in Me’ah but the time was never right. Eventually I decided that the time was as right as it would ever get, knowing that there would always be competing forces or as Hillel said “Do not say when I have free time I will learn, lest you not have free time.” If I wanted to learn there was no time like the present. Although I loved those first few weeks studying Bible, I also could not quite believe that I had to put forty (plus a few extra for snow days) recurring Thursday 7-10 PM appointments in my Google calendar. That is a lot of time for those of us who treat time as the precious entity that it is. My sense is that each person who participates in Me’ah does so for his or her own personal reason. For me, Judaism has always been important in my life, personally, and often professionally. However, I have always had the feeling that there were things missing in my knowledge base and my hope was that studying in Me’ah would change that. Having completed Me’ah (writing that sentence still doesn’t feel real) I now know, more than ever, that there are things missing in my knowledge base. However, I now feel positive about those gaps rather than negative. I know with certainty now that I will never know or understand everything about Jewish history and the Jewish experience but I now feel secure in my understanding that knowing everything is not the goal for me. My goal is continuing to learn with no hope of ever feeling that I know “enough.” And somehow that feels comforting and empowering in a way that I didn’t feel before. 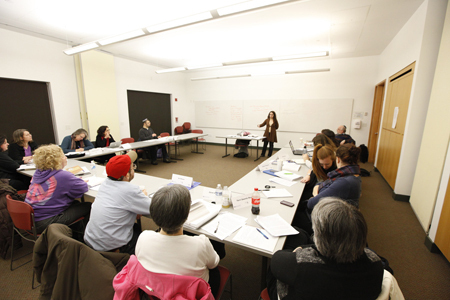 For information about Me’ah and a list of Fall 2014 classes, log on to www.hebrewcollege.edu/meah.